Update: This incident apparently happened in August of 2009. 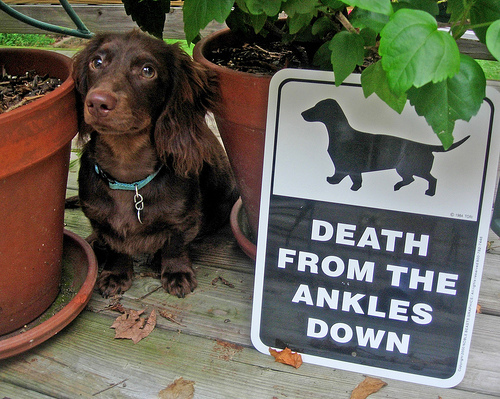 And the daschund weighs 17 pounds, but it's still a daschund. And the dog was so scared it was shaking. And the silly vet got in the dog's face unexpectedly and got bitten. Surely the correct thing to do here is not to euthanize the dog. I say find a new vet. The owners have spent more than $6,000 dollars already defending their 10-year-old pet. Update 2: Leave feedback for the Jasper Animal Hospital in Lafayette, Colorado and let them know how you feel about their attempt to euthanize someone's pet because they don't know how to handle a scared animal. Update 3: The City of Lafayette ignores a state law which says vets can't sue to have dogs get put down if they get bitten. The assumption being that people working with dogs are more likely to get bitten, and should, in theory, know that certain hazards come with the territory. Email the City Council of Lafayette at council@cityoflafayette.com and let them know your thoughts. Update 4: Sign the online petition to Save Spork! Update 5: Fox news has picked up the story. Apparently, Spork, a male dog, bit the the vet tech (a female) on the chin.